Composition - There definitely is symmetry in the building, but I don't see a lot in terms of the squares on the floor. The little one looks like the junior version of the big one, but still slightly different. I'd say it mostly meets the challenge, so we'll leave it at that. While the photo is not perfectly symmetrical, it is pretty well balanced. I think the plant in the middle is a little distracting, but also a good source of color aside from the floor color. The thing about the composition here is it just doesn't have anything there to grab me. I keep looking around the photo for something that isn't there. Its not a bad composition, just seems to be missing something. Technical - Good exposure, framing DOF and pretty sharp. Nothing really wrong here but it could be a little sharper. Engaging and unique communication of symmetry. I for one am really glad the hopscotch squares are not exactly the same. It adds interest while still retaining balance. Makes me want to go play. Nice pic. 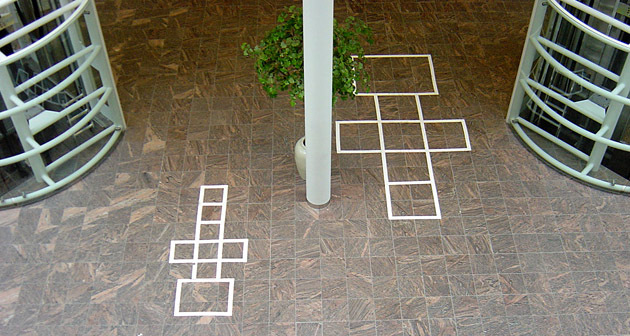 Hopscotch for all ages. Clever. Proudly hosted by Sargasso Networks. Current Server Time: 04/19/2019 04:17:11 PM EDT.